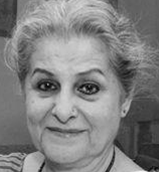 Syeda Hameed is a former member of India's Planning Commision. She is also the Chancellor of the Maulana Azad National Urdu University, Hyderabad. She is a known voice on gender justice, and is the founder member of the Muslim Women's Forum. Azad Forgotten: "I Will Relinquish Swaraj Rather Than Give Up Hindu Muslim Unity"